Upcoming shows, new music, events, workshops, teaching, Amazigh culture and general news about AZA and it's founders, Fattah Abbou and Mohamed Aoualou. 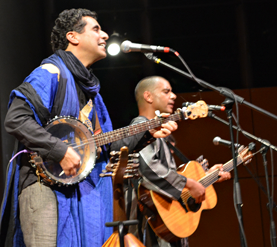 AZA unites traditional Moroccan Tamazight music with the global influences of its diverse members. This film dives into their musical background, their philosophy about music, and their performances. AZA unites traditional Tamazight (Berber) music, indigenous to the Atlas Mountains of Morocco, with the global influences of its diverse members. Evocative of Saharan-African blues, yet with an original style that truly defies categorization, AZA’s stirring performances feature deep, danceable rhythms, intricate string melodies, and soaring, soulful vocals. Visually dynamic and engaging performers, AZA has been inspiring international audiences for nearly ten years.